Ahmedabad, a city in Gujarat, is known as the Heritage City on the earth. In the era of digital world, there is no such city who has the image for awesome history and technology combined. So this was the prime goal of the event held at Pandit Dindayal Upadhyay Auditorium, Ahmedabad which was named ‘Smart Cities Conclave and Exhibition’. This event was held to pioneer and motivate multiple technology startups in order to see what best future can be nourished with the help of technology in order to build a Smart City. 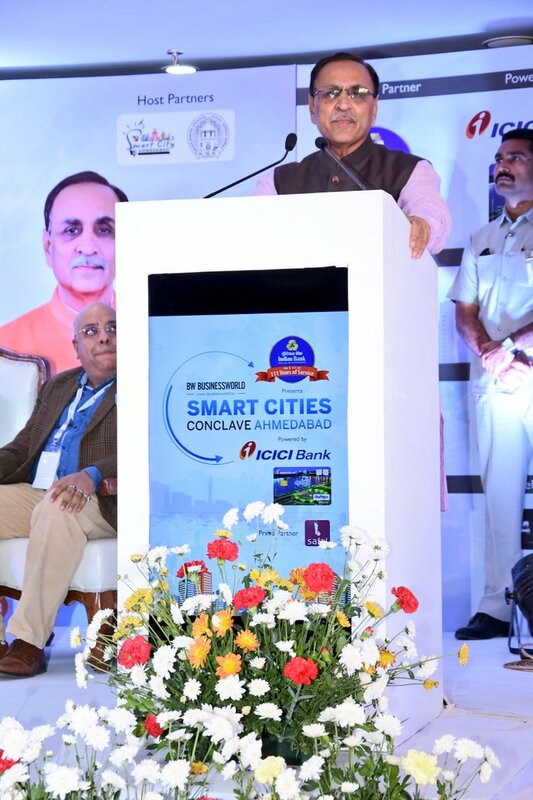 The event was eagerly anticipated by many infrastructure and technology juggernauts and the media as our honourable Chief Minister, Shri Vijay Rupani was coming to share a speech about the need of going to deliver Ahmedabad as a Smart City. 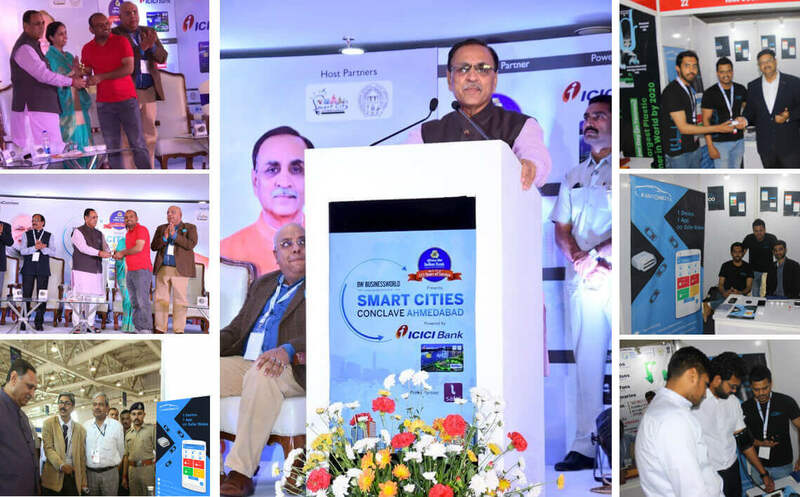 Smart Cities Conclave – Ahmedabad will be a platform to the key stakeholders to interact on important topics around Smart Cities, Smart & integrated Transportation, IT, Electronics, Startup & eGovernance, Energy & Power, Safe & Secure Cities, Skill Development, Smart Healthcare, and arrive on solutions to enlarge the Smart City ecosystem as well as explore maximum potential of projects undertaken for Digital and Smart Gujarat. Chief Minister shared a major time of his day for this event which shows how important the after actions of this event would be. Shri Vijay Rupani announced this multiple times with sheer pride and joy that Ahmedabad holds a great opportunity to become Smart City. He said there is no other city in this word that is known as a heritage city and Smart city both. Shri Vijay Rupani then goes down to the details of it by focusing on the certain aspects of the development of a Smart City using various technologies like Mobile Application Development, Emergency On-demand Services, Healthcare Solutions, Pollution Control, Road Safety, Waste Management and more. Every word he uttered during his speech was as inspiring as anything you may come across to build a better tomorrow for the citizens. Exhibitors were in full volume to gain the attraction to their individual brilliance and innovation to serve the purpose of this event. KarConnect and MedConnect, the two seperate IoT solutions catering automotive and healthcare industries. What if your City is Smart but not Safe? KarConnect helps! KarConnect is a robust IoT solution for road safety along with saving lifes of the people given damning stats on current number of deaths in road accidents. It has been apparent that accidents decreases the GDP growth, so it is vital to bring in a Smart automotive solution as the life is very precious. KarConnect also helps fleet management companies for Real-time tracking of the vehicles, tracking of driving behaviour, Vehicle Health Report, Roadside assistance and many more features. Download KarConnect Mobile App here. Team Let’s Nurture was there ready to sell their awesome devices with a huge discounts. So it was the opportunity for the others, not them to knock the door for their own future. 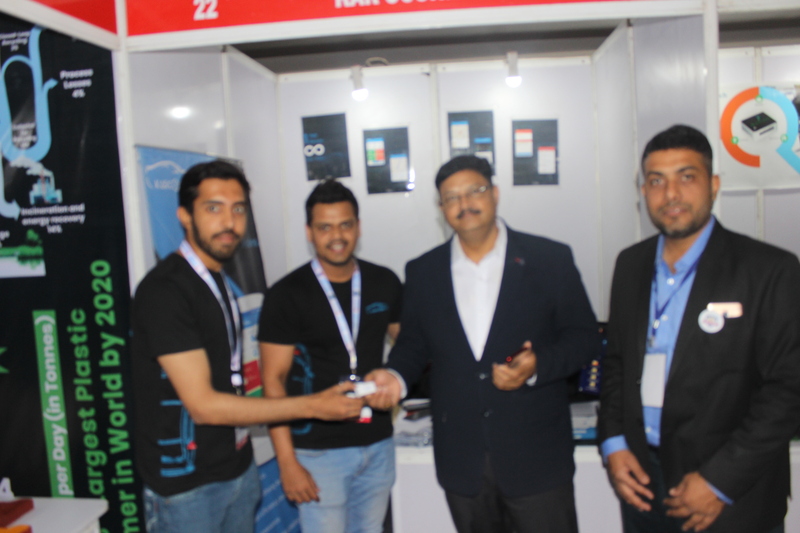 They sold KarConnect Solutions after impressing the visitors who were in awe of the solution along with the easiness and features of the KarConnect mobile application. 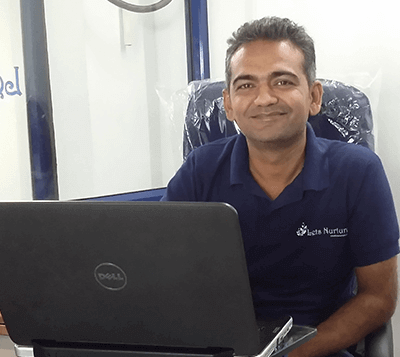 Mastering their expertise for providing Smart Solutions since last few years, they also come up with another Robust Healthcare Solution- MedConnect. A Saas based platform to provide smart healthcare solutions for government, healthcare institutions, fitness industry and companies to maintain healthy workforce to build smart cities. MedConnect is only one of the many IoT solutions provided by Let’s Nurture measuring vital statistics of human body and give instant data on your smart mobile application. 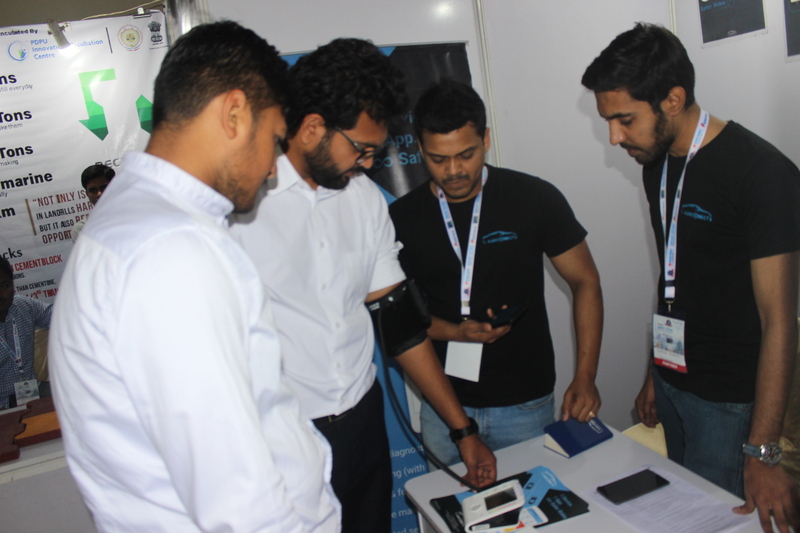 The Team gave the demos for Blood Pressure monitoring with the help of Digital Blood Pressure Monitoring device and MedConnect Application, where users or patients can use this solution to instantly check their health and keep the record of data to track the progress instead of going to doctors. Along with Smart Cities and innovations, IoT solutions for the safety are also vital. MedConnect’s Glucose Monitoring solution measures your glucose levels before and after your meals and maintains your records through the mobile app. With MedConnect- the complete Healthcare Solution, you can keep track of your family members, employees, drivers and yourself through one application and the hardware. The team is coming up with a range of monitoring devices like Sleep monitoring, weighing scales and cholesterol monitoring. Imagine these all devices will be compatible with one single Mobile Application- MedConnect. A ‘Smart but Safe Future’ must be considered in order to build Ahmedabad or any other city as a Smart City. The hard efforts marketing team of Let’s Nurture put in since early hours of 23rd February 2018 paid back during the networking and lunch hours. An assessment team of Smart Cities Conclave visited every exhibitor stall but kept it anonymous who they are and why they are doing it. They shared copies where they asked all exhibitors to fill their details and idea about their products. Later on, they just informed the exhibitors who were shortlisted to remain in the conference hall where respected Chief Minister was anticipated to deliver his speech. Team was present when the speech was delivered. After that an announcement was made to reward the startups with the best idea. 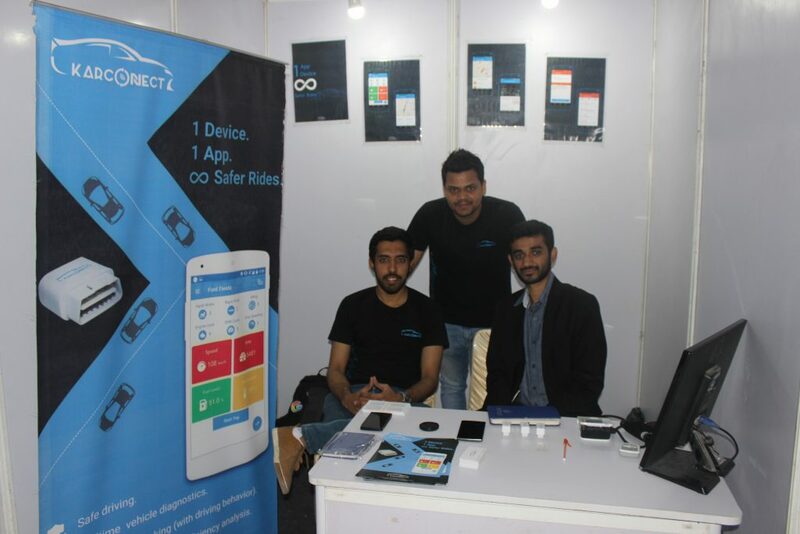 And guess what, in the next line it was KarConnect which was named as the best Startup in the event. 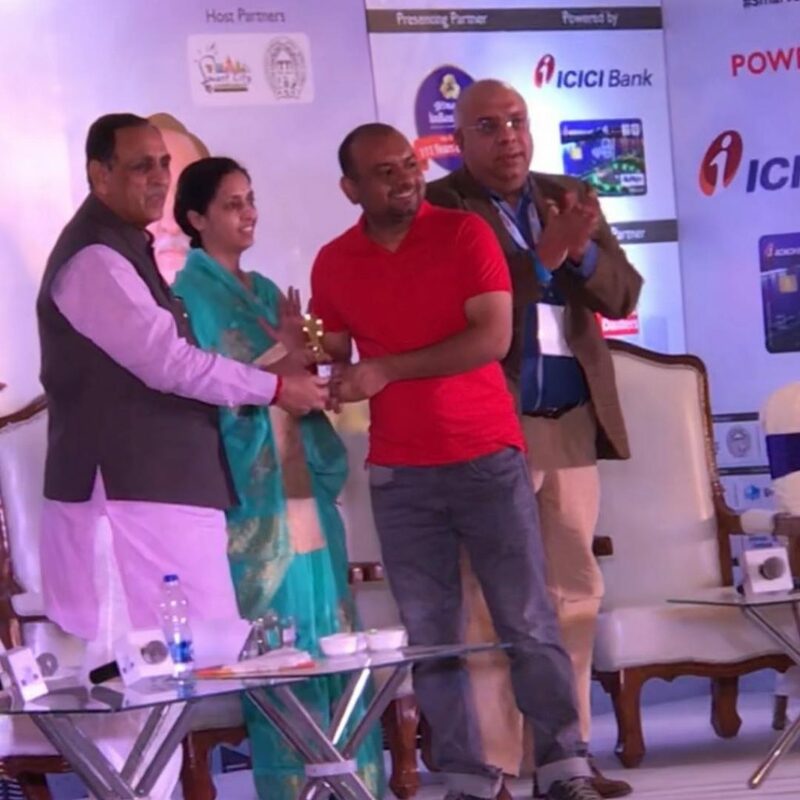 The host requested Shri Vijay Rupani to present a trophy to the winners. Mr. Ketan Raval, CEO and Founder- Let’s Nurture, was pumped with joy and walked towards the podium and received a trophy. Shri Vijay Rupani congratulated Ketan Raval and inspired him to keep going on to provide smart solutions to the city and the nation. The team presented there were also gobsmacked on the achievement. There was a flow of congratulations from multiple delegates, VIPs and other co-exhibitors. It was a great day that started with hopes and finished with a pride and happiness. Many people like us also believe that Life is all about putting efforts and cherishing the rewards. Let’s Nurture is actively looking for an opportunity to work towards nurturing lives with the help of technology and expertise in order to fulfill the dream of building Ahmedabad as a Smart City.